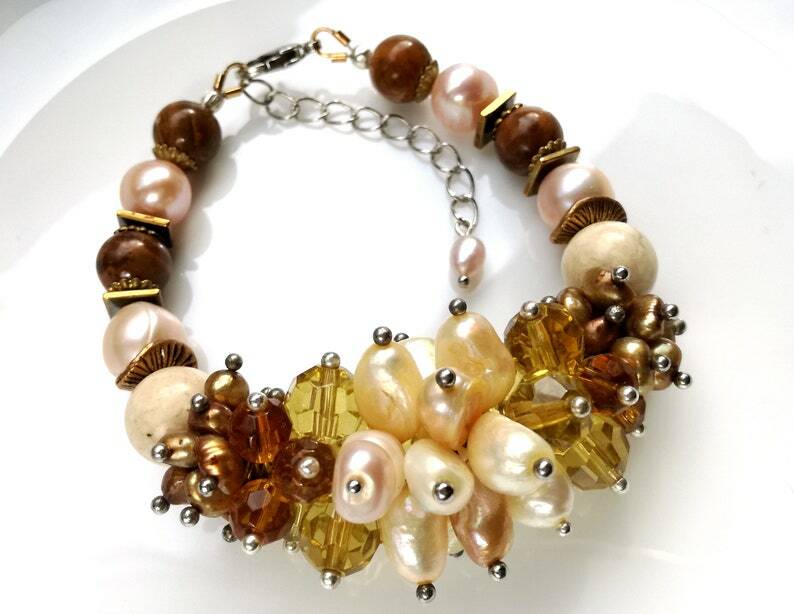 This fancy bracelet comes in shades of yellow, brown, gold, cream, khaki colors. All these warm hues will give a bliss to your style and make you feel unique. One-of-a-kind piece of art consists of freshwater pearls, brown jade, fossil and hematite gems, as well as some glass crystals. The length of this bracelet is 17cm with 4cm extender to fit your wrist perfectly. Beautiful bracelet! Very fast delivery! Such a unique piece! Arrived in a timely fashion and the cuff did not disappoint! Perfect in simple elegance. I really love it. Love it. simple elegant perfect.